More than a few contemporary baseball insiders viewed John Clarkson as the finest pitcher of the 19th century. He won 30 or more games in a season six times, including two of the top four all-time totals, 53 in 1885 and 49 in ’89. In the 10-year period between August 1884 and July 1894, he amassed 327 victories in the National League, and then retired at the age of 33. Clarkson was recognized as half of the “$20,000 Battery,” so called for the price Boston paid for the pitcher and King Kelly. Perhaps more recognize his name because he spent much of the last four years of his life in mental hospitals. Some even claim that the crazed former ballplayer mutilated his wife. Seemingly the Hall of Fame forgot his name entirely, overlooking his contributions until 1963. John Gibson Clarkson was born on July 1, 1861, in Cambridge, Massachusetts, to a Scottish-born father, Thomas G. Clarkson, and an Irish-born mother, Ellen M. (Hackett) Clarkson. John had two younger sisters, Isabella and Helena, and four younger brothers, Arthur, Thomas, Walter, and Frederick. Arthur and Walter, also pitchers, followed John into the majors, as did two cousins from his mother’s side of the family, Mert and Walter Hackett. In contrast to most big leaguers of the era, John was born into a family of means. His father owned a prospering jewelry and watchmaking business in Boston. John attended local schools and trained in the jewelry business as a teenager. He was also attracted to baseball, perhaps influenced by a watchmaking co-worker of his father’s and one of professional baseball’s founding fathers, Harry Wright. At his high school, the Webster School, John made the baseball team as a catcher in 1878. During the season, he also made his debut in the pitcher’s box. After high school he worked in the family trade and attended the local Comer’s Business School. Because Clarkson hailed from the Harvard University area, false reports throughout his career said he was a graduate of the university. He was not, but his brothers Walter and Frederick did, and played baseball there. Starting in 1880, John played amateur ball for the Beacons of Boston for a little over two years. He also played for the Hyde Park club at times. Clarkson was one of the Beacons’ star hitters and eventually developed into the club’s leading pitcher. The team played all comers, including major-league clubs, and Clarkson soon gained a reputation as one of the area’s leading hurlers. During his Beacon days he received some pitching tips from Boston Red Stockings pitcher Tommy Bond. In late April 1882, the Beacons played the Worcester Ruby Legs of the National League in an exhibition contest. Worcester manager Freeman Brown signed Clarkson soon after the game to help solidify his rotation, which had been a little shaky against some college squads that April. A few days later, on May 2, 1882, 20-year-old Clarkson made his major-league debut, in a home game against Boston. It was the second game of the season, on a very cold and windy day that kept the crowd to only 400. Though he was hit hard, Clarkson pulled out an 11-10 victory, helped by a couple of doubles of his own. He started again three days later but lost to Hoss Radbourn and the Providence Grays, 17-2. The reviews after the contest were stinging, for example: “With Clarkson as pitcher today, the Worcesters were beaten by the Providence team with the utmost ease, they batting Clarkson for fourteen singles and two two-baggers in the sixth and seventh innings.”1 On the 11th, he pitched better but lost again, 4-0, to Tim Keefe of the Troy Trojans. The rebound was noticed: “Clarkson pitched for the Worcesters and was quite effective, no earned runs being scored off his pitching.”2 In three games he pitched, opposite three of the toughest hurlers of the early professional era, Bobby Mathews (Boston), Radbourn, and Keefe, he fared adequately if unspectacularly. Unfortunately, his shoulder was ailing and he was released before the end of the month, within a week or so of his final game. It appears that he sat idle the rest of the season. After the 1882 season, Arthur Whitney, a Boston-Worcester area player, took over the Saginaw, Michigan, club of the Northwestern League. Whitney contacted Clarkson over the winter and signed him to a contract. At first Clarkson filled a utility role, playing every position but catcher. The club directors were unimpressed and soon discussed releasing the young player. Whitney then installed him on the mound and those thoughts dissipated. The move proved a success. 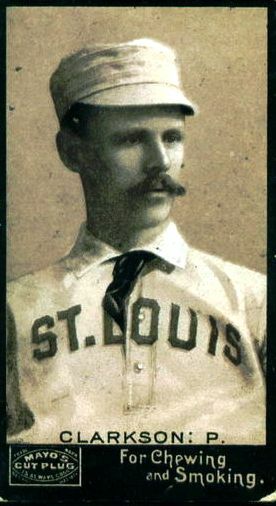 Clarkson appeared in 21 games as pitcher for the club; his record is unknown, but the team challenged for the championship all season, falling just two games short of the title. Clarkson credited Whitney with turning his career around and solidifying his spot in professional baseball. Specifically, Whitney helped convert Clarkson to an overhand pitcher, spending hours working on his motion behind the team’s hotel and at the ballpark. The overhand style was just about to become legal in the National League. Clarkson returned to Saginaw in ’84, posting a season that earned him accolades throughout the industry. In 45 games and nearly 400 innings pitched he accrued a 34-9 record with nine shutouts and a stunning 388 strikeouts and a 0.64 ERA – all by the middle of August. He hit .306 as well. He was regularly fanning upward of 10, 15 and even 19 batters a game. In five games pitched between June 30 and July 14, Clarkson racked up 73 strikeouts. This caught the eye of major-league managers. In early August, pitchers Jim McCormick and Jack Glasscock, along with catcher Fatty Briody, jumped the Cleveland National League club for Cincinnati of the Union Association. Manager Charlie Hackett tried to sign Clarkson to fill the void but the deal fizzled. Then, on August 14, the Northwestern League ousted the Saginaw club for nonpayment of dues and the club disbanded. Now a free agent, Clarkson fielded offers from Boston, Chicago, and Cincinnati but signed with Cap Anson of the White Stockings around August 24. His first game with the club took place three days later, a 5-3 loss to Hoss Radbourn. The St. Louis Globe-Democrat wrote of Clarkson after the game, “His pitching is very effective . . . He is a good fielder and his playing today showed him to be a valuable addition to the nine.”3 Clarkson appeared in 14 games for the White Stockings, posting a 10-3 record. On September 30, he struck out seven straight New York Gothams batters, and 13 in all. Clarkson was also fortunate to work with some of the best catchers of the day. With Chicago, Silver Flint caught 148 of his games. King Kelly worked as the backstop in 73 of Clarkson’s games with both Chicago and Boston. Charlie Bennett (119 games) and Charlie Ganzel (43) worked behind the plate in the bulk of his outings with Boston. Chief Zimmer (57 games) did the same with Cleveland. Years later Zimmer called Clarkson the greatest of all pitchers – and Zimmer caught Cy Young for nearly a decade. Chicago White Stockings manager Cap Anson said that Clarkson “was peculiar in some things, however, and in order to get his best work you had to keep spurring him along, otherwise he was apt to let up, this being especially the case when the club was ahead and he saw what he thought was a chance to save himself.”13 Anson added, “Many regard him as the greatest, but not many know of his peculiar temperament and the amount of encouragement needed to keep him going. Scold him, find fault with him, and he could not pitch at all. Praise him and he was unbeatable.”14 Anson suggested that Clarkson was deeply affected by razzing and would falter on the mound amid abuse. Some of these broad accusations, though, don’t seem to match up with the record books or day-in/day-out contemporary accounts. Clarkson started 1885 coaching the pitchers at Dartmouth. He continued to train college squads throughout his baseball career and into retirement. It was a part of his winter conditioning. The only year he took off from coaching was 1886 and that was because of his impending marriage. He coached Harvard pitchers from 1887 to 1892. In 1890 he also worked with the hurlers at the Boston Athletic Association. In 1893 and ’94 he worked out the staff at Yale. In ’94 he also trained the Union College pitchers in Schenectady, New York. The following year he worked for the University of Michigan. His talents went beyond baseball. In March 1885, Clarkson refereed a boxing match in Hanover, New Hampshire. It was a championship bout between a minor leaguer named Harmon and a Professor Craig. On train trips and in hotels throughout spring training and during the season starting in ’85, Clarkson and King Kelly entertained their teammates with song. By any measure Clarkson was the National League’s most valuable player in 1885. He started 70 games, finishing all but two, and posted a 53-16 record in 623 innings. Those 53 victories are the most in a season after Hoss Radbourn’s 59 the previous year. Clarkson tossed 10 shutouts and struck out 308 batters. All the numbers mentioned other than the loss total led the league. Chicago took the pennant by two games over New York that season; the rest of the league was at least 30 games behind the White Stockings. In the postseason championship series, the White Stockings tied the St. Louis Browns of the American Association, 3-3-1. Many modern researchers consider the postseason series that began in 1884 to be the first World Series, but the tie that year goes a long way at viewing the 19th-century postseason contests as mere exhibitions. After the season, Clarkson barnstormed in St. Louis before returning to Chicago for the winter. He stayed in Chicago to split the distance with his girlfriend, Ella Moorhead McKenna. Ella, from Detroit, was born in May 1860. They met when he was with Saginaw. On March 4, 1886, the couple married. She traveled with the club that spring to Hot Springs, Arkansas, and back. Over the years she attended many games. It’s probably good that she did since Clarkson attracted more than his share of women to the park. He was a good-looking Irishman with dark hair and bluish-gray eyes. And he was a bit of a dandy when it came to his attire, as the Sporting Life noticed: “All of the Chicago players dress well off the field but Clarkson is the bright particular dude of the team. He is very scrupulous about his dress, and there is considerable of the English in his style.”16 The Detroit Free Press said, “His uniform was always immaculate, his linen always possessed the fresh-from-the-laundry touch, he was always smoothly shaved, his manners were always faultless.”17 He also wore a silk handkerchief on the outside of his uniform. In 1886, Clarkson won 36 games in 55 starts, striking out 313. On August 14 he defeated St. Louis, 5-2, for the 17th consecutive time, a record that still stands. Four days later, he fanned 16 Kansas City batters to set the club record. On August 23, Clarkson tossed a one-hitter over Detroit, losing a no-hitter in the eighth inning on a controversial hit by Deacon White. Chicago won the pennant by 2½ games over Detroit. Again the White Stockings faced the St. Louis Browns of the American Association in the postseason. This time St. Louis won, four games to two. Clarkson was 2-2 in four starts, winning Games One and Three. The series is memorable for the sixth and final game, a contest regarded as one of the finest of the era. Clarkson took the mound with his club down three games to two and took a 3-0 lead into the eighth inning, hoping to tie the series. However, the Browns pushed across three runs to even the score. In the 10th, St. Louis outfielder Curt Welsh tried to steal home. He was seemingly caught but Clarkson’s pitch to King Kelly went astray and Welsh scored the winning run. Clarkson had apparently crossed up his catcher. It was known as the “$15,000 Slide” because of the winner-take-all agreement between the clubs. The Chicago players were drinking heavily during the series, some showing signs of drunkenness while on the field. Clarkson may not have been drinking during the day, but he was tearing it up at night. It was said that he was slotted to start Game Five but couldn’t because of a hangover. It was the only time in seven tries that an American Association club won the postseason series between the two leagues. Clarkson wanted a salary close to that of Bob Caruthers, a pitcher for St. Louis, who was making a reported $4,500. The Sporting Life took the pitcher’s side: “Clarkson has pitched more games in the last two years than any other pitcher in the country. No wonder he feels sore when he considers that he is not paid as much as many players who are playing with weaker clubs and only pitch once a week or once in two weeks.”20 Clarkson also cited Henry Boyle, a pitcher for Indianapolis, who made $500 more than he did with a weaker team in a smaller market, with a lighter workload and less success. Clarkson, or more likely some friends, approached Boston Beaneaters president Arthur Soden and asked him to work a trade. Soden offered the White Stockings $7,500 as early as September 1887. It wasn’t enough; Spalding was holding out for more. Part of Spalding’s negotiating stance was to declare that the club would rely on Gus Krock and George Van Haltren on the mound for the coming season if Clarkson chose to hold out. Clarkson was equally as adamant, in fact more so. In December he declared, “You can depend upon it that I will not play in the Chicago club next year under any circumstances. … I think it is about time that I should have something to say where I shall play. I will remain in Boston and work at my trade. I mean just what I say. I will not play in Chicago under any circumstances.”21 He threatened to sit out the season and join the family business if not traded. Spalding shot back that he would simply blacklist the player if he didn’t report in the spring. Clarkson started on Opening Day 1888, not ceding a hit until the sixth inning, and Boston won its first nine games, five of which were credited to their new ace. In all, he went 33-20 with a league-leading innings total (483 1/3) again. The club, though, finished in fourth place, 15½ games out. Clarkson was appointed temporary captain in April 1889 amid fighting between the club directors, on the one hand, and player-manager John Morrill and King Kelly, who presented separate issues, most involving his alcoholism. Morrill was sold to Washington, where he became manager, and Jim Hart was brought in to manage the Beaneaters. It looked to be a bright year indeed. After spending all that money for Kelly and Clarkson, Boston tapped the failing Detroit Wolverines for Charlie Bennett, Dan Brouthers, Charlie Ganzel, and Hardy Richardson. The club went 18-4 in May to take a 3½ game lead in the standings. Clarkson didn’t lose his second game until June 10, by which point he was 15-2. In the first game of a doubleheader on June 22 in Pittsburgh, Clarkson shut out the Alleghenys 5-0, allowing only five hits and striking out 12. In the seventh inning of the second game he was ejected while sitting on the bench. Pittsburgh manager Fred Dunlap noticed that Clarkson was signaling to his teammate, pitcher Bill Sowders, and informed the umpire. On July 12, Clarkson was pulled for some extra rest in the fifth inning despite leading 10-0 and tossing a no-hitter. Reliever Sowders gave up just one hit the rest of the way in the 13-1 defeat of Pittsburgh. On September 16, the Beaneaters started a 15-game road trip to finish the season. They stood a half-game behind the New York Giants in the standings. Clarkson and the club directors agreed that he’d pitch every game down the stretch for some extra compensation. Clarkson actually started 13 of those games, taking two games off, but that was done in consultation with club officials. It was a tactical error; the pennant slipped out of Boston’s hands. For the first time in major-league history, the pennant came down to the final day of the season (October 5). The Beaneaters were facing Pittsburgh, and the Giants were playing the Cleveland Spiders. Clarkson and Boston manager Jim Hart made waves by offering the Cleveland battery $1,000 if they defeated New York. The money would come from a previous promise by the Boston Globe to reward the local club if it copped the pennant. New York in turn offered a suit of clothes to the Pittsburgh players if they stopped the Beaneaters. Henry Chadwick, for one, found this all distasteful. Clarkson lost to Pittsburgh, 6-1, and New York defeated Cleveland to take the championship by one game over the Beaneaters. As would be the case for decades to come, the contenders played an uneven number of games: New York finished at 83-43; Boston, at 83-45. Drinking may have cost the club the pennant, as more than a few of the men imbibed heavily as the season and summer moved to a close. Clarkson won the pitching Triple Crown, leading the league in wins (49), strikeouts (284), and earned run average (2.73). He tossed eight shutouts. The 49 wins are the fourth highest total in major-league history. In the five seasons from 1885 to 1889, Clarkson posted a 209-93 record with 295 complete games, 2,716 innings pitched, and 1,365 strikeouts. For all this work and success Clarkson wasn’t even listed among the top 20 earners of 1889 according to the Spalding Guide. He wanted his big payday. In secret, Clarkson started trading telegrams with Beaneaters owner Arthur Soden, and a deal was worked out. Soden said, “We paid John Clarkson $25,000 for three years. For simply signing his name to a contract we paid him $10,000. This is the largest salary that has ever been paid to a baseball player.”30 It was in fact a lot of money; no one had been guaranteed $25,000 before. Clarkson made the best deal possible, financially speaking. The pitcher also agreed to act as an agent for the Boston club. Soden gave him carte blanche to re-sign as many men as possible. He talked Pop Smith and Charlie Ganzel into re-signing with the club and approached several others, including Hardy Richardson and even Kelly. Clarkson also sent telegrams to and later visited Charlie Bennett’s residence and signed him up as well. Naturally this was in violation of the agreement Clarkson had made with the Brotherhood and most of his teammates and friends around the league. It wasn’t received well, many believing that he previously sat in on their meetings solely to report back to Soden and the League. Fred Pfeffer recalled, “I never saw such a change in a man in my life. When I last saw him before that he was as strong a Brotherhood man as could be found and dwelt at length on the prospects of the Players League. Then he became an icicle. It chilled me through to hear him talk and I walked away from him.”31 Someone discovered that Clarkson was working as an agent for the League and sent a telegram to John Morrill, a secretary of the Brotherhood, in San Francisco. It read: “Clarkson is a traitor and is working for Soden. Show this to the boys and watch Clarkson.”32 He wasn’t treated well after that and had a strained relationship with many for months to come, even years. For the rest of the barnstorming trip, many shunned Clarkson, blasting him for his duplicity. Kelly, once a good friend, apparently was among them. Their friendship never recovered. Boston dropped to fifth place in 1890 despite 26 wins from Clarkson. On April 19, he won 15-9 over Brooklyn even though he himself committed 10 errors, which were actually wild pitches. Sloppily, there were a total of 35 errors in the contest. The Players League folded after only one season and the men funneled back to their old teams. During the negotiations Monte Ward declared, “The talk of refusing to play with (Jack) Glasscock, (Jerry) Denny, Clarkson, or any of the deserters from our ranks is all bosh. Of course it is a bitter pill, but for the sake of peace and harmony we will swallow it.”34 That was merely the face of the union speaking publicly; the friction did not go away. Many of the men had issues with Clarkson and he was treated rudely and shunned by some for the rest of his career. Some observers claimed that a few of his teammates slacked off while Clarkson was on the mound, the very thing Conant, the Beaneaters director, feared previously. King Kelly for one refused to return to Boston, instead jumping to the American Association, in part because he didn’t want to play with Clarkson and Charlie Bennett. Both Clarkson and Kid Nichols won at least 30 games for the Red Stockings in 1891 and the club captured the pennant by 3½ games over Chicago. Clarkson presented a new look for 1892, shaving off his trademark mustache for a season or so. He started off shakily, posting an 8-6 record through 16 games. On May 6, he went toe-to-toe with Cincinnati and opposing pitcher Elton “Icebox” Chamberlain for 14 scoreless innings, giving up only four hits but walking six. Chamberlain surrendered only three hits and a walk. “Six times during the game for Boston and four for Cincinnati would a base hit have decided the contest,” the Boston Globe wrote the next day.35 The game was called at the beginning of the 15th inning “on account of the sun,” as the umpire Jack Sheridan declared that it was beating in the batters’ and pitchers’ eyes. A sore arm kept Clarkson off the mound from May 15 to 25. On the 26th, he defeated Louisville 7-0 but lost a no-hitter with two outs in the ninth when Hughie Jennings placed a single. With a young Kid Nichols developing into an ace, Arthur Soden was looking to shed the expensive Clarkson but was a little hesitant to do so since he was still under the three-year contract for which the club had given him a significant signing bonus. Regardless, on June 30, 1892, Clarkson, whose record was 8-6 at the time, was given his unconditional release. The dismissal had as much to do with cutting costs as it did with Clarkson’s shaky start and questions about the health of his arm. With the merger of the National League and American Association, only one major league operated in 1892. The owners were thus in a position to tighten their belt. They would soon implement system wide payroll cuts and institute a salary cap. Cleveland owner Frank Robison wanted Clarkson, but his co-owners didn’t. Robison pressed and got his way. It added to a rift among them though, which wasn’t resolved until Robison bought the others out later in the summer. The Spiders signed the free agent on July 5. The payroll cuts hit just as Clarkson joined the Spiders; every man was required to sign a new contract at a lower rate. Clarkson’s days of being the staff ace were over in Cleveland; that distinction belonged to the speedballer Cy Young. Clarkson did well, winning 17 games for the club and proving that his arm was holding up by pitching a total of 389 innings. He won his first game for the Spiders on July 9, an 8-2 victory over Tim Keefe. On September 21, he claimed his 300th major-league win, a five-hitter over Pittsburgh that the Spiders pulled out in the ninth inning, 3-2. Cleveland finished in second place, 8½ games behind Boston. Since there was only one major league, the top two teams faced off in a championship series. Boston won the series, five games to none, with one tie. Clarkson lost both of his starts. In Game Five, he blew a six-run lead and lost, 12-7. Before the 1893 season, the pitching rubber was pushed back another five feet to the current distance of 60 feet 6 inches. It signaled the beginning of the end of Clarkson’s effectiveness. Though only 31 years old, he couldn’t adjust adequately and won only 24 more games in 53 starts. He did, however, log the innings once again, a total of 445 2/3. Cleveland gave Clarkson a contract for $2,500, which was actually $100 over the salary cap. It was also $200 more than Cy Young was making. That didn’t sit well with Young, and the club had to renegotiate with its ace. The next season, 1894, couldn’t have started any worse for Clarkson. He planned a camping trip near Kansas City with his good friend and former batterymate Charlie Bennett. On the trip in early January, Bennett carelessly hopped off the train to speak with a friend. He slipped, fell under the wheels and lost parts of both legs.36 The scene was bloody and horrifying. Clarkson was dramatically affected. He was already drinking heavily toward the end of his career, and the incident didn’t help matters. Clarkson stayed with his friend for over a month, returning home on February 19 to take over the Yale pitching staff. He helped organize a benefit for the catcher later in the year. On July 12, 1894, Clarkson made his final major-league appearance, in a 20-10 shellacking by Philadelphia. The next day he was traded to Baltimore for another aging pitcher, Tony Mullane. Orioles manager Ned Hanlon was happy to make the trade for the pennant run, declaring, “Clarkson has not been satisfied in Cleveland and will show his appreciation of the change of base by demonstrating that he is still one of the best pitchers in the business. He has, beyond doubt, the easiest delivery of all the pitchers. His coolness in trying circumstances is proverbial. I have made many deals in my effort to build up a team, but none which gave me more satisfaction that when I traded Mullane even up for Clarkson.”39 The Washington Post was a little less enthusiastic about the repercussions of the trade: “It is an open secret that Clarkson has been dissatisfied in Cleveland and anxious to get away, while Mullane is never satisfied anywhere, so neither team has much the worst of the bargain.”40 The Boston Globe saw little for the Orioles to gain: “Perhaps John Clarkson may do better in Baltimore than Cleveland. But that remains to be seen. His work this season is decidedly of the passé order.”41 To Hanlon’s dismay, Clarkson refused to join the Orioles, returned home to Bay City, Michigan, and retired. Mullane appeared in four games for Cleveland and was done as well. For his career, Clarkson inserted a 328-178 win-loss record into the books and nearly 2,000 strikeouts. Before the mound was pushed back to 60 feet 6 inches in 1893, he fanned the second most batters, behind Tim Keefe. Clarkson failed to complete only 33 of his 518 starts. He also knocked 24 home runs, a number by far the most of any 19th century pitcher and a record that lasted for decades. In September 1894, John and Ella Clarkson purchased a cigar store and manufactory at 103 Center Avenue in Bay City. They later opened a wholesale business on Fifth Avenue and a retail establishment in the Phoenix area. In 1904 they opened another cigar enterprise at Sixth and South Sherman Streets in Chicago. The latter three businesses proved unsuccessful. The decade after leaving baseball was for the most part spent managing his four business enterprises. John’s brother Arthur moved to Bay City to help run the businesses after his professional baseball career ended. He initially worked as a clerk in the cigar store and then took over operations at the Phoenix location. Later, he opened a clothing store a few doors down from the cigar shop. During this time, John made infrequent trips to Boston to visit friends and family and to Detroit to check in with Charlie Bennett and Ella’s family. Ella moved in with her in-laws. Clarkson remained, for the most part, at McLean except for occasional furloughs during holidays and such. His family visited often. Eventually he lived with his wife and parents for stretches at a time. A report from Cambridge in February 1908 claimed that Clarkson “is looking well.”50 He was living with his family and often visited friends in Boston. He was even seen as a spectator at a ballgame that October. John was supposedly doing well at the end of the year. Ella visited Bay City and told reporters that her husband was improving and perhaps might leave McLean. That was perhaps wishful thinking. The truth is that the doctors saw little long-term hope for her husband. In January 1909, Clarkson was living with his parents at their home on Wave Way Avenue in Winthrop, Massachusetts. He became ill with pneumonia and was readmitted to McLean. Both lungs were overtaken by the illness; Clarkson lapsed into a coma and died on February 4 at the age of 47. The death certificate listed the cause of death as lobar pneumonia of six days’ duration. It also noted that Clarkson had suffered from a general paralysis for the past several years. John Clarkson was buried in the family plot at Cambridge Cemetery. He rests not far from Tim Keefe. Unfounded rumors persist that Clarkson killed his wife. The fact is that after his death, she returned to Bay City and helped Arthur Clarkson in business. Bay City erected a ballfield soon after John’s death and named it in his honor. In 1963 one of the top pitchers of the 19th century was finally inducted into the National Baseball Hall of Fame. Too often reviewers have projected Clarkson’s psychological problems at the end of his life back into his playing career. There may indeed have been some clues, but a lot has been read into little things, and too much has been interjected into the story long after the fact. Too many have taken liberties with supposed clues of mental instability during his playing career. There are no hints of significant mental difficulties in contemporary accounts before his entering a sanitarium, which, by the way, was more than a decade after his retirement from the game. Later claims that he was a loner, high-strung, moody, and depressed both on and off the mound were exaggerated in an effort to signify underlying troubles. Clarkson was calm and collected on the mound; he was noted as so time and again. He may have disliked being singled out for razzing at times but that is not abnormal. He may have needed coaxing at times but isn’t baseball history littered with stories of catchers and managers giving pitchers pep talks? It’s amazing how a pitcher can be so successful year in and year out, month-in and month-out and some claim he was still prone to “wilt” or “wither” on the mound. Cap Anson made several comments about Clarkson’s temperament at or near the end of the pitcher’s life that some have used to trace his mental difficulties back as far as two decades before he actually was institutionalized. It’s perhaps telling that these quotes don’t show up in Anson’s book A Ball Player’s Career, which was published in 1900 before Clarkson had his breakdown. Anson chose to add these characterizations only after Clarkson’s difficulties became known publicly. In the book, Anson talks about Clarkson needing encouragement throughout the game to keep him focused, but nowhere does he mention anything about the pitcher’s fragile temperament. An updated version of this biography is included in "20-Game Losers" (SABR, 2017), edited by Bill Nowlin and Emmet R. Nowlin. There is no relation between the author and Mrs. John Clarkson, the former Ella McKenna. There is a persistent story that John Clarkson threw a lemon to the plate during one game to demonstrate to umpire Jack Kerins that it was too dark to continue play. The story suggests that Kerins called the pitch a strike, thus proving Clarkson’s point. No date or even year is ever identified in the claim, suggesting that it has never been verified. Kerins was a substitute umpire for only one game in the National League, on September 6, 1888. At the time, Kerins was living in Indianapolis, his birthplace. The game he umpired pitted Pittsburgh against Indianapolis and didn’t involve Clarkson. The story was introduced into lore by John McGraw at the time of the publication of his book My Thirty Years in Baseball. In an accompanying piece distributed by the Christy Walsh Syndicate in January 1923, McGraw claimed that the pitcher was “Clarkson, I think.” In the story the catcher was Wilbert Robinson. While it’s not impossible that those two were batterymates at some point during some postseason or preseason, it’s more likely that the pitcher was merely misidentified 30 years later. If the lemon story in fact has merit and Kerins and Clarkson were participants, it surely would have taken place during an exhibition contest. Atchison Daily Globe, Kansas, 1887, 1888, 1894. Baltimore Sun, 1887, 1889, 1909. Bay City Journal, Michigan, website Bjmi.us.com. Bay City Times, Michigan, 1909. Bay City Tribune, Michigan, 1895, 1909. Boston Advertiser, 1880-81, 1887, 1888, 1890, 1893. Boston Globe, 1887-94, 1905, 1908, 1909. Cedar Rapids Evening Gazette, Iowa, 1885. Daily Review, Decatur, Illinois, 1905. Egan, James M. Jr. Baseball on the Western Reserve: The Early Game in Cleveland and Northeast Ohio, Year by Year and Town by Town 1865-1900 (Jefferson, North Carolina: McFarland, 2008). Fleitz, David L. Cap Anson: The Grand Old Man of Baseball (Jefferson, North Carolina: McFarland and Company, Inc., 2005). Ivor-Campbell, Frederick, Robert L. Tiemann, and Mark Rucker, eds. Baseball’s First Stars (Cleveland: The Society for American Baseball Research, 1996). James, Bill, and Rob Neyer. The Neyer/James Guide to Pitchers: An Historical Compendium of Pitching, Pitchers, and Pitches (New York: Simon and Schuster, 2004). Kusmierz, Marvin, “John Gibson Clarkson (1861-1909),” Bay City Journal website, September 2002. Lowell Sun, Massachusetts, 1905, 19’09. Milwaukee Sentinel, 1884-86, 1889-90, 1894. Morris, Peter. A Game of Inches: The Stories Behind the Innovations That Shaped Baseball, The Game on the Field (Chicago: Ivan R. Dee, 2006). Pearson, Daniel Merle. Baseball in 1889: Players vs. Owners (CITY, Wisconsin: Popular Press, 1993). Rocky Mountain News, Denver, 1887. Society for American Baseball Research. The SABR Baseball List and Record Book (New York: SABR, 2007). Washington Post, 1885, 1888-95, 1904, 1907. 1 “Providence-Worcester,” Inter-Ocean (Chicago), May 6, 1882: 4. 2 “Troy 4, Worcester 0,” Chicago Tribune, May 12, 1882: 6. 3 St. Louis Post-Dispatch, August 28, 1884: 8. 4 Elijah P. Brown, The Real Billy Sunday: The Life and Work of Rev. William Ashley Sunday, D.D. The Baseball Evangelist (Dayton, Ohio: Otterbein Press, 1914), 41. 5 “Base Ball Players Busy,” Brooklyn Daily Eagle, November 25, 1888: 10. 6 “Notes and Comments,” Sporting Life, October 21, 1885: 3. 7 “Sporting Odds and Ends,” Inter-Ocean, July 22, 1891: 3. 8 John Clarkson, National Baseball Hall of Fame, baseballhall.org/hof/clarkson-john Date accessed January 4, 2017. 9 Jonathan Fraser Light. Cultural Encyclopedia of Baseball 2nd Ed. (Jefferson, North Carolina: McFarland, 2005), 198. 10 “Current Gossip of the Sporting World,” Harrisburg (Pennsylvania) Daily Independent, February 9, 1909: 2. 11 ”Clarkson, $10,000 Pitcher, Is Dead,” Chicago Tribune, February 5, 1909: 10. 12 Harry Clay Palmer [Remlap], “From Chicago,” Sporting Life, October 7, 1885: 5. 13 Adrian Constantine Anson, A Ballplayer’s Career: Being the Personal Experiences and Reminiscences of Adrian C. Anson (Chicago: Era Pub Co, 1900), 130. 14 Harvey Frommer Old Time Baseball: America’s Pastime in the Gilded Age (Lanham: Maryland: Taylor Trade Pub, 2005), 125. 15 “Notes and Comments,” Sporting Life, August 5, 1885: 5. 16 “Notes and Comments,” Sporting Life, July 14, 1886: 5. 17 Quoted in Fleitz, David L. Ghosts in the Gallery at Cooperstown: Sixteen Little-Known Members of the Hall of Fame (Jefferson, North Carolina: McFarland and Company, Inc., 2004), 112. 18 Chicago Herald story which ran in the Freeport Journal-Standard (Freeport, Illinois), October 14, 1887: 4. 19 “Doings on the Diamond,” Wilkes-Barre Sunday Morning Leader, September 11, 1887: 6. 20 “Notes and Comments,” Sporting Life, October 11, 1887: 3. 21 “Clarkson Dead Set Against Chicago,” Chicago Tribune, December 10, 1887: 2. 22 “He is Ours,” Boston Globe, April 4, 1888: 1. 23 Tim Murnane, “Conant After Omaha,” Boston Globe, September 24, 1889: 5. 24 “Warring Baseballists,” Chicago Tribune, November 12, 1889: 3. 26 “Nothing But a Name,” Evening Star (Washington, D.C.), November 8, 1889: 7. 27 “Kelly in San Francisco,” Omaha Daily Bee, December 4, 1889: 1. 28 “Chicago’s Backers,” Sporting Life, November 20, 1889:5. 29 Quotation found in unidentifiable newspaper clipping. 30 Philip E. Shirley, “Alas, Poor Yorick!” Sporting Life, April 14, 1906: 9. 31 “Out-Door Sports,” Lawrence Daily Journal (Lawrence, Kansas), February 12, 1890: 4. 32 “Triumvir of Traitors,” Saint Paul Globe, (Minnesota) December 10, 1889: 5. 33 “Brotherhood Men Here,” Chicago Tribune, January 12, 1890: 7. 34 “All In favor of Peace,” New York Times, October 10, 1890: 3. 35 “Not a Run Scored,” Boston Globe, May 7, 1892: 5. 36 “Bennett’s Recovery Assured,” Boston Globe, January 19, 1894:2; “Cut a Hot Pace,” Boston Globe, February 20, 1894: 2. 37 Reed Browning, Cy Young: A Baseball Life (Amherst: University of Massachusetts Press, 2000), 29. 39 “Clarkson Will Join the Baltimores,” New York Times, July 16, 1894: 8. 40 “Sporting News and Comment,” Washington Post, July 16, 1894: 6. 41 “Base Ball Notes,” Boston Globe, July 17, 1894: 2. 42 “Clarkson Would Not an Umpire Be,” Chicago Tribune, June 15, 1897: 4. 43 Cited in the Denver Post article “May Still Be a Good One,” March 17, 1904: 7. 44 “Base Ball Notes,” Washington Post, May 12, 1905: 4. 45 “Needs A Rest,” Boston Globe, May 7, 1905: 25. 46 “Clarkson’s Passing,” Sporting Life, February 13, 1909: 6. 48 “John Clarkson Failing,” Boston Globe, December 12, 1905: 7. 49 “Alas, Poor Yorick!” Sporting Life, April 14, 1906: 9. 50 “National League News,” Sporting Life, February 29, 1908: 3. 51 Homer A. Rodeheaver, Twenty Years with Billy Sunday (Nashville, Tennessee: Cokesbury Press, 1936), 50. Cited in “A Short History of Baseball and Tobacco,” in Peter Carino, ed., Baseball/ Literature/Culture: Essays 2004-2005 (Jefferson, North Carolina: McFarland, 2006), 128.